As the saying goes, fashion fades, but style is eternal. The best way to show the world that you’ve got style? Shopping smart for looks that last. It’s true—some closet staples deserve a little higher budget than others. Not sure where to splurge and where to save this season? Check out our advice for perfect wallet and closet harmony. A great pair of jeans is a worthy investment. Higher-end denim is engineered to fit really well and last a long time, and hey, it makes every part of you look better. Buy a pair in a classic wash and style and be set for literal years of looking great. Tops with lots of details are a trendy way to give your look a little something extra this season, but add one to your closet without the big spending. Pocket the savings and focus on the right denim instead. Denim strikes again. The jean jacket can be your go-to for throwing on over dresses, pants, even over a bathing suit at the beach. A jean jacket looks good with everything and works for multiple seasons—we love it layered with a hoodie in cooler months. Calculate your cost-per-wear and we’re sure this will be one purchase you’ll never regret. 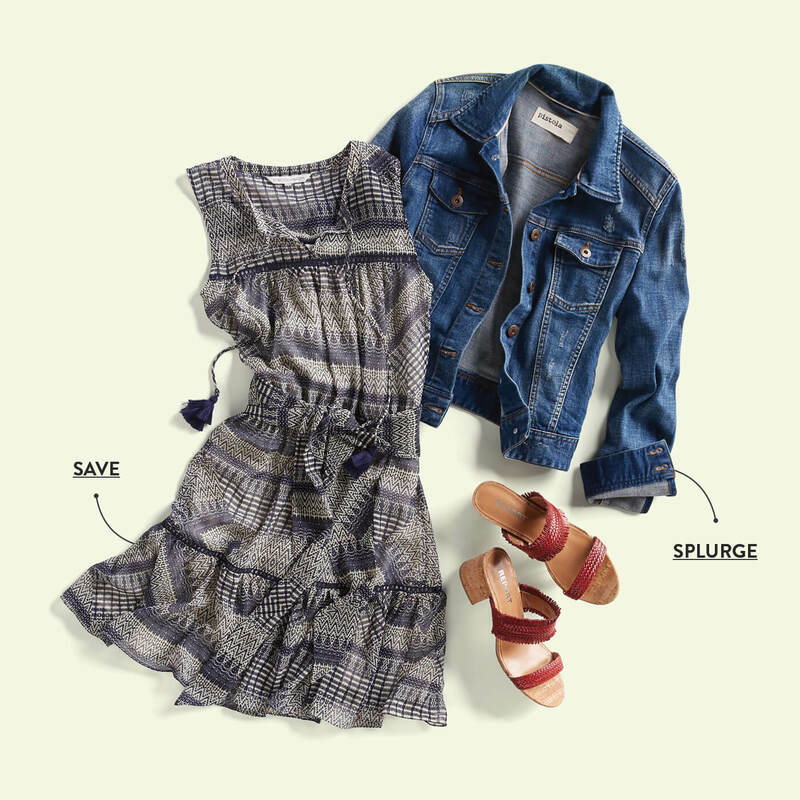 Easy, breezy summer styles like a dress with loads of pretty details, a romper in a light-as-a-breeze fabric, or an embellished peasant top are just the things when you want to bring your wardrobe into warm weather readiness. These pieces are fun, on-trend and you don’t want to miss out on wearing them, but you may not want to break the bank for them, either. Look for seasonal prints, flowy fabrics and unusual styles. The most elegant, day-to-night slide in day-to-night black is a worthy investment any time of year. Wear this sleek pair with virtually anything, from evening looks to denim or with button-down for daytime, fashion editor chic. This date-worthy floral fantasy of a jumpsuit is a super-splashy trend you may want to try. But if it’s a little out of your comfort zone, don’t spend a lot. We have a feeling you’ll love taking something like this for a spin, for minimal monetary outlay. A bag for beach, brunch, travel is worth a queen’s ransom—or maybe just a bit more than you’d pay for a super-trendy style. A canvas or fabric style is perfect for summer, and cool color blocking ensures you look great, wherever you go. Printed pants with a pretty tie-waist are a trend you should definitely try—but you don’t need to spend a lot. Pants like these are perfect for warm weather—we love them with a plain white tee or a chunky cotton knit when the sun goes down. See pieces that you can’t wait to save and splurge on? 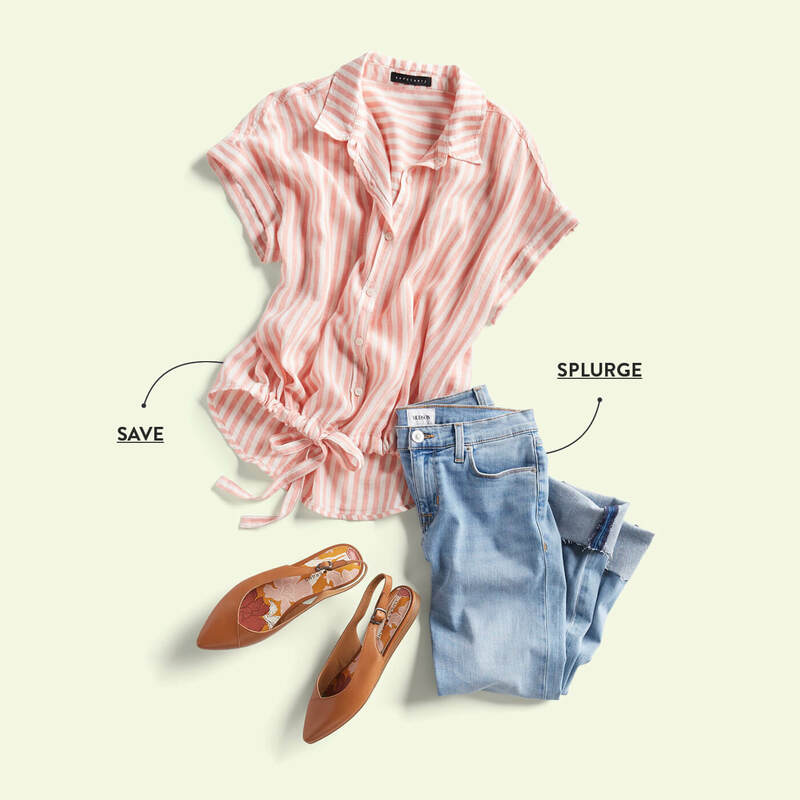 Set your budget, then schedule a Fix for your favorite summer splurge or save pieces!